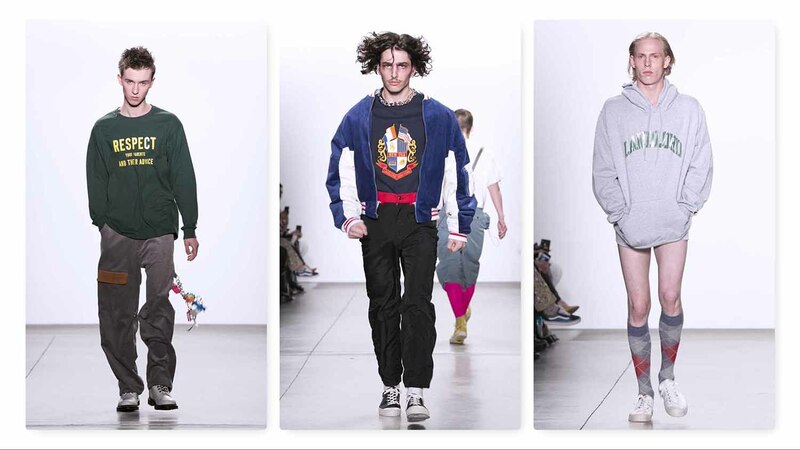 Giving a very intriguing “New USA” title for his Fall 2019 collection, Landlord’s Creative Director Ryohei Kawanishi was inspired by what we wear to school from kindergarten to university. The result, an eclectic mix of elements that actually worked! Mixing the very formal crests of the Ivy League with the very playful colors the children’s playground and shapes from the jungle gym made a fashion statement. The formal meets informal style is so in tune with Gen Z and the Millennials whose interests and activities are so varied that it is hard to keep up. But, Kawanishi got it without even trying! Coach jackets are made from striped school uniform fabric, sweatpants are made from wool suiting and blazer jackets mix panels of herringbone check with bright corduroy. The focal points of Autumn/Winter 2019 are the leather coats, exhibiting superior tanning craftsmanship in lively neon colors. The accessories de rigueur are the jewelry made by Kota Okuda which reimagine neckties as necklaces and links blocks, keychains and money into bracelets and belts. Money clips are jewels. Kota debuted his first collection of money-inspired womenswear in the Parsons MFA graduate show in September 2018. Collaborations for the Autumn/Winter 2019 collection include a continuation of LANDLORD’s partnerships with Alpha Industries, Kosuke Tsumura and Novesta. New collaborators and sponsors include Nakaden Keori, Edovance, Kubera, Miyuki Keori and Bonnie Clyde Eyewear. Autumn/Winter 2019 marks LANDLORD’s seventh season, and sixth consecutive season showing at New York Fashion Week: Men’s. Retailers include Barney’s New York, Opening Ceremony, Dover Street Market, SSENSE and several stockists in Japan. Dubbed by Billboard Magazine as “hip-hop’s favorite label,” LANDLORD has been worn by many celebrities, including Big Sean, Joey Bada$$, Migos, A$AP Rocky, Rae Sremmurd, The Weeknd, Tyga, Wiz Khalifa and more.